Renishaw's Equator system, a software-driven comparative gauge, has reduced the need for numerous hard gauges at aero-engine component maker Meyer Tool in Cincinnati, Ohio, saving a potential $20,000 per gauge. In its pre-launch application at Meyer Tool, one Renishaw Equator gauge has eliminated at least four costly hard gauges in a new work cell. "And that's just the beginning of the impact the company anticipates for its inventory of custom hard gauges, which can cost up to $20,000 each to design, build and maintain," according to Beau Easton, Quality Manager at the company, "down the line, design changes can add another $3,000 -- $10,000 to re-configure and qualify an existing gauge." Renishaw's Equator replaces multiple hard gauges and can be re-configured with simple programming. For in-process dimensional measurement, the company principally relies on work-cell-based point-to-point contact gauges, using pneumatic digital probes. Hard gauges in the machining cell give very fast feedback but are expensive. Design/build of the part nest can cost $6,000, plus probes at $500 each, verification studies, and maintenance, Easton explains. 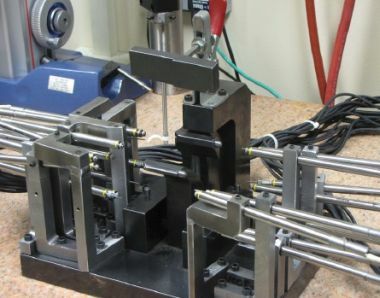 "If we are producing a make-complete nozzle, there could be six to ten fixtures, each with six to twenty probes, and if a feature or tolerance on the part changes, it adds time for the gauge to be altered and verified." When shown Renishaw's Equator comparative gauge and offered a pre-launch trial, Easton and SPC Manager Bridget Nolan said they immediately recognized the potential. "We got involved with Renishaw's introduction of the system and provided parts. 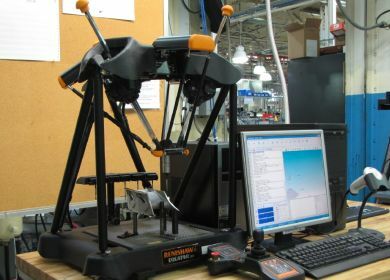 Renishaw programmed them, and the results matched our Coordinate Measuring Machine (CMM) results," says Nolan, whose group sets up, maintains and programs the company's gauges, fixtures and instruments. Though its appearance is unusual, the Equator system uses the comparison method of mastering and measuring familiar to anyone who uses dedicated gauging systems. A master component with features of known dimensions is used to "zero" the system, with all subsequent measurements compared to this part. Hard gauging can cost up to $20,000 and take weeks to re-configure. The key to the Equator system is a highly repeatable and radically different metrology mechanism based on a parallel kinematic structure. This mechanism is lightweight, allowing rapid motion, yet very stiff and repeatable. The system uses Renishaw touch and scanning probes, styli and stylus change racks, and MODUS Equator programming software. Cost-wise, three to five hard gauges in a Meyer Tool work cell can all be replaced by one Equator -- and the Equator can be used for multiple parts, switching between them in seconds, as well as reprogrammed for many other parts over its life. The Equator system is currently assigned to a lean machining cell in Meyer Tool's shop. Demonstrating its adaptability, it integrates with Meyer's Orion SPC system, maintaining a familiar look for machinists and shortening the learning curve. Orion communicates with the Equator's MODUS software, presenting the operator with results in the form of dimensional data, SPC charts, etc. that allow the operator to determine CNC. "Keep in mind the machinist sees variable data and can compare the current part with recent measurements, so it's not just a pass/fail determination," Nolan explains. The parts must meet tolerances of ±0.001 to ±0.003 inches. Inspection time varies with the part but typically takes two to six minutes, well within the TAKT time of the cell so the system easily keeps pace with machining operations. The Equator is the ideal inspection system for use inside manufacturing cells, as it maintains a small footprint with portability, and is versatile in overall measurement capabilities. "We already gauge five part numbers for two different engine programs, so we have multiple fixturing tiles for the Equator setup and qualified," Nolan said. "We try to combine as many different operations on one tile as possible to limit our qualifications, and we're currently working on one tile that will combine three. We are doing GD&T true positions, notches, hole diameters, profiles, runout, and such with touch probing, though we are implementing contact scanning with the SP25M probe. We have the stylus changing rack and use at least four different styli -- frequently star styli -- so it's very convenient not to have to re-qualify with every change," Nolan says. The Equator measurements at Meyer Tool are correlated with those from a CMM, using a CMM-calibrated master part. "The master part sets the values the Equator expects to find inside its measuring envelope while the software automatically applies the compensation values from nominal taken by the CMM. It must check within 10 percent of allowable tolerance from nominal," Nolan explains. There is no need to re-master on every part change, Meyer have decided to re-master on a 3-hour schedule to compensate for changes in the plant's temperature. "The Equator system memorizes the master parts and validation scores, so we can switch parts as many times as needed during the 3-hour window, and not have to re-master," Nolan says. Meyer Tool is a leading U.S.-based producer of hot-section jet engine components for aerospace OEMs, employing more than 1000 at ten locations. The Cincinnati headquarters (one of the city's ten largest private employers) specializes in new parts, while some other Meyer facilities do repair and overhaul for the OEMs. Principal workpiece materials are super alloys, nickel and cobalt-chromium based. The Orion system provides real-time SPC feedback on measurements taken by the Equator. With nearly 500 fast-hole EDM drillers, Meyer Tool is the North America's largest EDM-based manufacturer. These machines are supplemented by 45 grinding stations, 300+ conventional ram EDMs, plus CNC 3- and 5-axis machining. The company EDM-drills more than 1.75 million holes per day, and with one blocked hole out of hundreds capable of causing failure on military high-pressure blades, Meyer Tool is fanatical about quality. The company employs 10-15 quality engineers, eight Black Belts, and an SPC team of five. "We began implementing Lean principles more than 10 years ago, followed by AS9100 certification," Easton says. "The investment has paid off, too. Our first time yield rate is 98.9 percent -- that is, first time off the machine without non-conformance or reject." This was accomplished by getting real-time feedback "turned up" to a much higher level, he adds. The information backbone of the company's gauging, SPC and quality system is its own Orion software and workstations, sold commercially through its subsidiary, Sigma Technology Services. Precision measurements are acquired with a touch probe driven by three encoders, maintaining a perpendicular orientation to products being inspected. All parts are 100-percent inspected by various means, including laser scanning and touch probing on CMMs, 5-axis vision, radiometric measurement and flow path scanning, among others, all of which are networked on the Orion system which serves as a common operator interface on measurement systems. Measurement programs, results and SPC data are managed by the Orion system. When a machinist completes an operation on a part, its serial number is scanned into the system, the part is measured, and the machinist can immediately see the results and compare them with the last 35 similar parts that have been measured. "You can scan a part's serial number into any terminal in our plant and see its measurement data," Easton says. "This information stays with the part. Before it ships, all inspection data is checked that all points passed, and any failed point kicks the part out until it passes all checks. Our ppm "escape rate" is almost non-existent; customers know this." With well over 100 hard gauges costing $10-20,000 each throughout its facilities, Meyer Tool recognizes the potential cost advantages of a flexible, software-driven gauging system. "We are still expanding our knowledge and capabilities with the Equator system, but have high expectations it will ultimately alleviate a large part of our cost burden for hard gauges," Easton adds.